The Book Lantern: Review: "Quicksilver" by R.J. Anderson. Review: "Quicksilver" by R.J. Anderson. Release date: May 2nd 2013. Summary (taken from Goodreads): Back in her hometown, Tori Beaugrand had everything a teenaged girl could want—popularity, money, beauty. But she also had a secret. A secret that could change her life in an instant, or destroy it. It’s a sadly rare occurrence these days for a YA book to not only surpass my expectations but entirely blow them away. At least this means that when it does happen, I appreciate it all the more, particularly when said book is the sequel to a book I had found to be underwhelming. 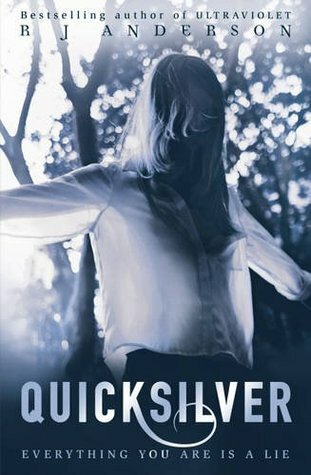 “Quicksilver”, the sequel to last year’s “Ultraviolet”, is a truly special YA experience – a well-crafted and socially novel that continually surprises, takes risks and keeps the reader gripped. For me, the real strength of “Ultraviolet” lay in the prose, and R.J. Anderson continues to demonstrate her skilful approach to writing, with a degree of confidence I felt was missing from the first book. “Ultraviolet” felt jumbled and unsure of what it wanted to be (although I understand that I am in the minority in thinking this), whereas here, “Quicksilver” knows exactly what it wants to achieve as a piece of fiction. This book is more tightly plotted, a pleasant surprise given that the plot is also quicker paced, and full of moments of genuine tension. I particularly admire Anderson’s approach to telling this story – it’s so unlike anything in YA right now, it crosses the genre boundaries repeatedly and is populated by fully fleshed characters rather than puppets or tropes. Anderson doesn’t let up on the fast moving plot, but she never sacrifices moments of genuine, natural human interaction in favour of such things (or romance, which was a huge relief). Tori/Nikki, the protagonist, is such a skilfully crafted character, one who is trying so hard to understand herself. The supporting cast is equally well crafted, with the heroine’s friend and confidante Milo Hwang standing out as particularly interesting. The pair’s interactions feel so fresh in comparison to so much stuff in YA right now. Their relationship is not one built on insta-love attraction or how pretty they find each-other. It’s one of mutual respect, curiosity and the simple joy of finding someone to trust. I also give major props to Anderson for creating a diverse YA that draws attention to important social issues. Racism, sexism (particularly in fields considered mainly male) and sexuality are all touched upon in a way that never feels preachy. This is a novel that is aware of its socio-cultural context, and it’s a breath of fresh air to see a YA novel doing what the industry so often preaches but never practices. The inclusion of an asexual protagonist was just the cherry on top of the cake. While I cannot speak for all LGBTQIA people on this matter, I felt that Tori/Nikki’s asexuality was dealt with maturely and handled pretty well. She’s a fully fleshed character who happens to be asexual, and it was wonderful to read. Overall, Anderson handles diversity issues very strongly, and I would recommend “Quicksilver” as an excellent example on how to do it right in YA. My review is deliberately vague because I really don’t want to spoil this for potential new readers. This is not a series with low expectations and it’s certainly not one that automatically awards its characters a happy ending, regardless of how much they deserve it. “Quicksilver” is not a novel that a new reader can jump straight into, one of the very few negatives I can think of, so I would recommend reading “Ultraviolet” first. Anderson has built on the foundations she lay down in the first novel and created something suspenseful, tense, well-crafted, and cliché busting. YA novels like this don’t come along very often, and in an industry currently churning out overhyped assembly line style stories of join-the-dots levels of predictability, we owe it to ourselves and the industry to go off the beaten track. With thanks to NetGalley for the ARC. I did not receive payment or compensation for this review.